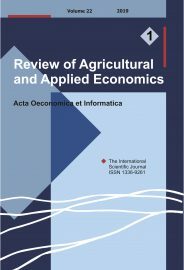 Review of Agricultural and Applied Economics (RAAE) is committed to the academic community and therefore seeks to publish original work in the best possible form and to the highest possible standards. Articles submitted for publication are double-blind peer-reviewed. That is mean: reviewers are unaware of the identity of the authors and authors are unaware of the identity of reviewers. There are at least three or more reviewers for the total number of articles in each issue. It is necessary to agree upon standards of expected ethical behaviour for all parties involved in the act of publishing (authors, editors, reviewers, publisher). The RAAE ethic statements are based on the guidelines and standards developed and published by the Committee on Publication Ethics (COPE). All documents are available free of charge on COPE website (http://publicationethics.org/). All new submissions to the RAAE are subject to screening using Crossref Similarity Check powered by iThenticate for plagiarism detection, before being sent to reviewers. Plagiarism, duplicate publication, data fabrication and falsification and improper credit of author contribution are serious violations of publication ethics. Thus, the plagiarism, fraudulent or knowingly inaccurate statements constitute unethical behaviour and are unacceptable. Submission of the same manuscript to more than one journal concurrently, constitutes unethical publishing behaviour and is unacceptable. The default similarity report view gives the percentage of the text of the manuscript which has overlap with published articles. Note that a high similarity score does not necessarily indicate plagiarized text. A similarity score of 30% could mean 30% text in common with one source but could equally mean 1% text in common with 30 different sources. Re-used text that has been legitimately cited the Bibliography and Methods texts may all contribute to the similarity score. The subject knowledge of an editorial expert is vital in order to interpret the CrossCheck report and determine whether there are any grounds for concern. The publisher and the RAAE have a zero-tolerance plagiarism policy. The RAAE editors are responsible for deciding which of the articles submitted to the journal should be published. The RAAE editors will accept and evaluate manuscripts for their intellectual content regardless of race, gender, nationality, ethics origin, political philosophy, religious belief or sexual orientation of the authors. During submission, authors are required to agree to the Author’s Declaration confirming that the work as submitted has not been published or accepted for publication, nor is being considered for publication elsewhere, either in whole or substantial part; the work is original and all necessary acknowledgements have been made; all authors and relevant institutions have read the submitted version of the manuscript and approve its submission; all persons entitled to authorship have been so included; all work conforms to the legal requirements of the country in which it was carried out and to the Journal’s policy on these matters. Authors guarantee that the manuscript has not been copied or plagiarised (in whole or in part); a paper should contain sufficient detail and references to permit others to replicate the work; any used information resources (phrases, data, images, …) must be appropriately cited or quoted. Authorship should be limited to those who have made a significant contribution to the manuscript content. All those who made significant contribution should be listed as co-authors. Affiliation (all authors/co-authors) and corresponding address (main author) must be clearly stated. Review of Agricultural and Applied Economics (RAAE) is committed to respecting data-protection regulations. This statement informs you of the steps we take to protect your rights. By using our site and by sending your names, addresses and other information, you accept that such personal data will be gathered and stored in our databases. This data will be used by RAAE to provide you with the services you have required. We may also occasionally use it to inform you about provision of new services and changes of services. By sending your information to RAAE, you agree that the RAAE can use your email address. RAAE cannot take responsibility for information found on third party Web sites outside its control. While we attempt to provide links only to third-party Web sites that comply with all applicable laws and regulations and our standards, please understand that the content on these third-party Web sites is subject to change without notice to the RAAE. We therefore cannot be responsible for, and accept no liability for, any information or opinion contained in any third-party web site. For the uniqueness and the originality of scientific articles authors are responsible. However, the editors seek to prevent the spread of plagiarism in the scientific sphere. All copyrights remain the author of the article. Authors agree with publication and other dissemination of their articles in world wide web for scientific use and citations. Any further distribution of the RAAE papers must maintain attribution to the author(s) and the title of the work, journal citation and DOI. If you are the author of the original article and wish to reproduce the article in full or in part in your PhD thesis you are free to do so providing you cite the original source article. We follow Sherpa/Romeo‘s blue archiving policy. Post-print or publisher’s version/PDF is archived, without restrictions.